We believe in abiding in applicable law and regulations and to strive for continual improvement in order to provide good quality products so that our clients will be satisfied as well as aim the products at 100% quality assurance. Hokkai Iron Works achieved 8.5 million sheets of deliveries for 40 years without an accident. Yixing HOKKAI achieved 1,000,000 sheets of deliveries for 10 years without an accident. 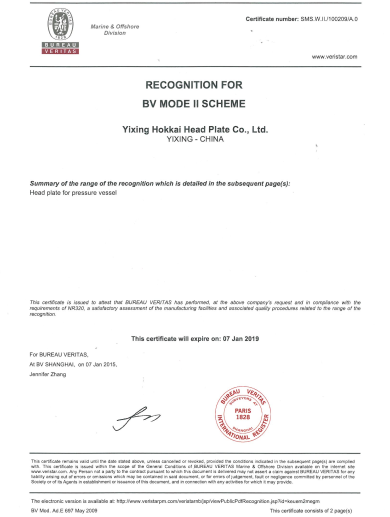 Achieved monthly production and sales of more than 12,500 sheets of high quality head plates. Looking for ideal Stainless Steel SA240-316L Manufacturer & supplier ? We have a wide selection at great prices to help you get creative. All the 2:1 Ellipsoidal Dish Head are quality guaranteed. We are China Origin Factory of High Quality Chemical Reactor Parts. If you have any question, please feel free to contact us.